Pianist, improvisator and composer, Raphael Sudan is an up-and-coming musician in Switzerland. 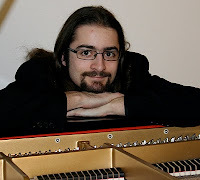 Born in 1985 in Fribourg, he got his Master Degree in Musical Performance in June 2010, in the class of prof. Ricardo Castro. During his studies, he allready was gaining momentum all over Europe, which also brought him to play concerts in many european countries, as well as China and North America. Active member of « ISIM » (International Society for Improvised Music) and prize-winner of the aucience's award at Versailles's Conservatory Improvisation Competition (France), he attaches a lot of importance to this discipline. It is a real joker for him, that he uses in most of his concerts, and that he also uses as a pedagogic support with his students. He now teaches both piano and improvisation at the Musich School of Chateau-d'Oex, Switzerland, where he also conducts a choir and a brass band.